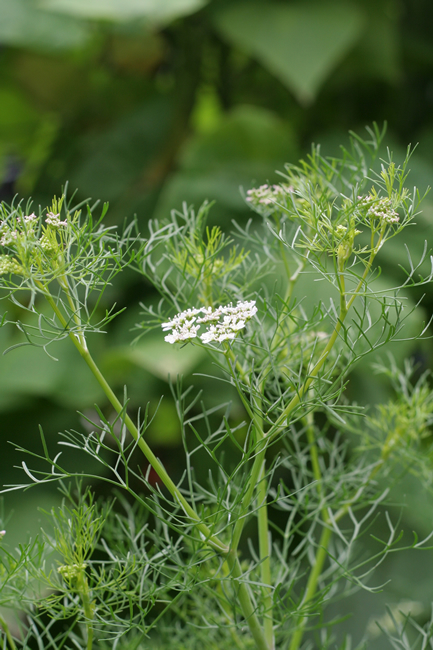 The botanical and common name, coriander, comes from the Greek word koris which means ‘bug’. This presumably relates to the fact that the smell and flavour of coriander has been unfavourably compared with that of stink bugs. This erect annual herb has lower leaves that are rounded and lobed, while the upper leaves are linear and finely dissected. Small flat umbels of pale pink flowers appear from mid-summer, and these are followed by fruits that are small green berries and which become brown and ridged when fully ripe. These drop very quickly once they are ripe and will self sow readily. The whole plant contains a fragrant volatile oil. There are now several cultivars that vary in flavour, size and tendency to bolt to seed in hot conditions. Coriander starts with flat parsley-like leaves but older leaves are slender and deeply divided. Grow coriander from seed sown in spring or autumn. Although I prefer autumn because then you get months of harvesting before they even think about going to seed. Plant the seed where you want the plants to grow as plants don’t like being moved. Seed can take a while to germinate and it may be several weeks before the first young leaves appear. Thin to about 15 cm between plants. In areas with hot, dry summers, seedlings will go to seed very quickly, so in these places coriander is best planted in autumn. 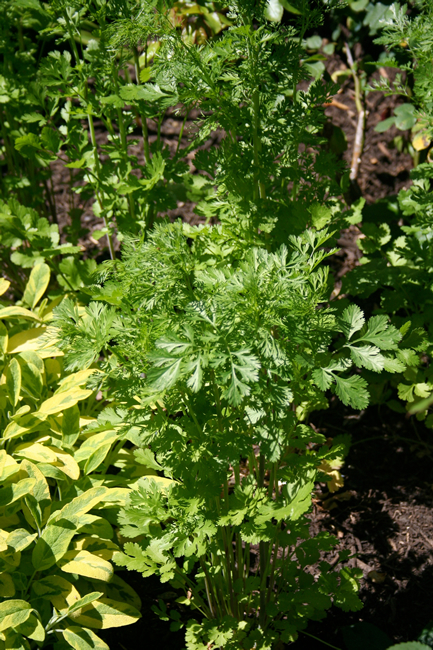 Coriander does well in any good, nutrient-rich soil that is well drained. In most regions in Australia, coriander does best in partial shade, but in cooler regions grow it in full sun. Keep well watered. Start harvesting leaves after about 30 days. Leaves have the best flavour while the stems are still soft and before the flowers start to form. Whole plants can be harvested for their roots at the same time. As the seeds ripen towards the end of summer their strong odour gives way to a sweet, orangy scent, when crushed. The seeds need to be harvested quickly, as they turn from green to brown, before they drop. Cut off the whole seed head and hang upside down in a paper bag, in a dry, airy, shaded position. When the seeds are dry, strip them from the stems and store in an airtight container out of direct light. Coriander is a nutritious herb rich in calcium, phosphorous, beta carotene and vitamin C. It has an unusual, very strong taste when fresh, and both the leaves and roots are commonly used in Asian cooking. Leaves are used as garnish and to add fragrance to soups, meat dishes and particularly fish dishes. They are always added towards the end of the cooking process. Don’t bother drying the leaves as they don’t keep their flavour. The Chinese use leaves in dim sum stuffing and in soup. The Vietnamese use fresh coriander leaves in soups, salads and noodle dishes. Thais add fresh roots to a range of dishes and a combination of coriander root, garlic and pepper all crushed together is an essential seasoning in many Thai dishes. The dried seed has a sweet, almost orangy, taste and is an important ingredient of most curry spice mixes. Ground coriander, cumin and turmeric are the basic ingredients of most curry powders. The flavour of the seeds is enhanced if they are lightly cooked in a dry frying pan and then crushed just before they are to be used. Dried powdered seed is used to disguise the flavour of some of the more unpleasant medicines, and chewing the seed stimulates gastric juices and aids digestion. Bruised seeds can be applied externally to rheumatic joints to relieve the pain. They are also used in baking to flavour bread and cakes, in confectionary and to flavour liquers. 1) Finely chop the coriander and place into a bowl. 2) Drain the liquid from the salmon and add to the coriander, then add the cream cheese and lemon juice. 3) Mash with a fork or puree with a food blender until a smooth paste is formed. 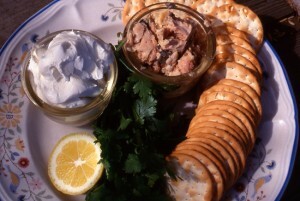 4) Place into a small decorative bowl, garnish with coriander leaves and serve with biscuits or corn chips for dipping. Other herbs that can be added to this and other dips are basil, borage flowers, chives, dill, fennel, garlic leaves or cloves, lemon balm, parsley, salad burnet and tree onion leaves.